Posted by Administrator on June 11, 2018. 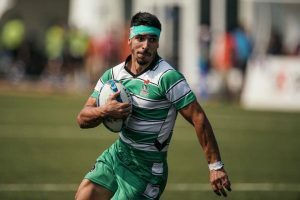 Rugby Games are very rarely delayed or cancelled due to weather conditions and almost unheard of at first class and international levels. Although a rarity, rescheduling has been known to happen due to the extreme conditions of the field of play. One of the most high profile matches to be rescheduled was the 6-Nations match between France and Ireland scheduled for 11 February had to be rescheduled for the 4th of March 2012, due to unplayable conditions of the pitch – a first in 27 years. The two teams were supposed to play at the Stade de France but with extremely cold temperatures reaching -5 degrees Celsius plus a wind chill factor of -11 degrees Celsius, the match was postponed for fear of the dangers that a frozen field might cause the players. When it was finally played a few weeks later on the 4th of March, a crowd of 80,000 watched as both teams quite appropriately drew 17-17 at the end of the whistle. 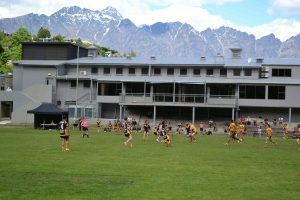 There are now a number of Rugby fields across the globe that are by way of location, prone to extreme weather conditions such as the “Rugby Pitch in the Sky” in Alaska, Sharjah Wanderers RFC pitch in the UAE and Wakatipu Rugby pitches in Queenstown, New Zealand. Their locations at times, expose them to very cold or very hot weather. For this edition however, we look at five of the top historic “most extreme” conditions where top class Rugby has been played. 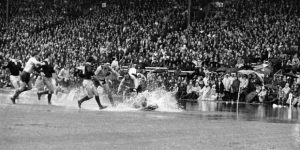 Heavy, torrential rain poured down at Kings Park Stadium in Durban, leaving the grounds flooded with pools of water all over the pitch. 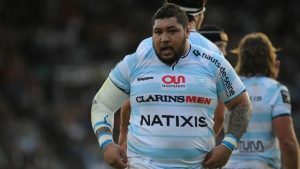 The Springboks did not want the game called off as it would have meant that France would progress to the Final due to a better disciplinary record throughout the tournament. The skies cleared and the game was played on the heavy pitch where ball handling was difficult to say the least. The Boks won the game 19-15 and eventually defeated the All Blacks in the Final. A mist descended on Jade Stadium, Christchurch (now known as Lancaster Park) about an hour before the kickoff to the Final of the Super 14 in 2006. 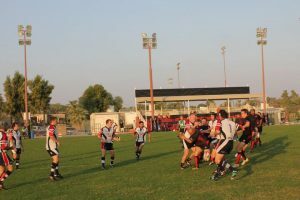 Higher cameras could not pick up enough of the game so that they had to switch to ground level ones and commentary had to be done from the sidelines. Visibility was also difficult for the players and expansive play was a rarity. 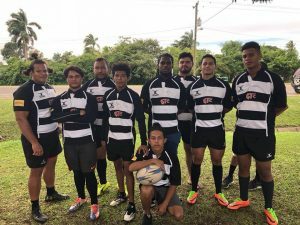 Casey Laulala scored the game’s only try as the Crusaders took the match 16 – 9. The Springboks toured New Zealand in 1981 despite all other nations having refused to host them in protest of the Apartheid regime. There were protests throughout the whole tour but on September 12th, anti-tour protesters took things up a notch by throwing flares on to the pitch and flying airplanes low over the field to drop flour bombs during the game. All Black prop Gary Knight was struck by one but thankfully, no one was seriously injured. 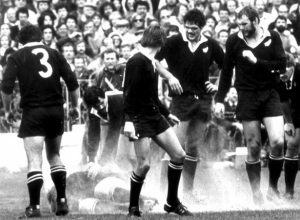 Allan Hewson eventually kicked a penalty goal in injury time to give the All Blacks a 25-22 win. It is 2.10 pm in the afternoon and the third Test between the visiting All Blacks and Scotland is about to begin at Murrayfield. Unfortunately, it is winter time in Scotland and on this particular day, nature had decided that darkness would descend very rapidly. With no lights, play was difficult and the television cameras of the 1970s struggled to capture images the darker the day became. A 18-9 win for the All Blacks saw them claim their first Grand Slam against Scotland. Scotland was scheduled to fly out the next day. Had they not, the game would have certainly been postponed. Eden Park was so flooded that it had become Lake Eden and playing became ridiculous at times. 13 penalties were awarded but neither team opted for a kick at goal. The All Blacks eventually won the match 24 – 0 and the game would forever be remembered as “The Waterpolo Test”. 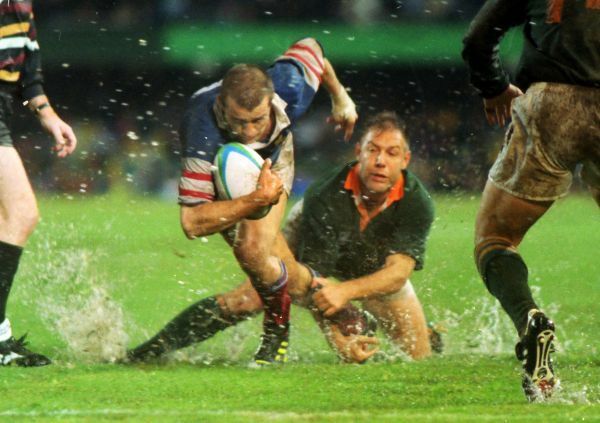 Share with us your most extreme conditions in which you have played Rugby in.